Hong Kong vegetarian restaurants are very popular in Hong Kong, not to mention it's popularity among all of this city's inhabitants. It is also because there are many taoists in Hong Kong whom always consume vegetarian food. Look at this Hong Kong vegetarian dish. The main ingredient is tofu. Isn't it beautiful? My brother-in-law is a semi-vegetarian. Because of his religious beliefs, my family always explores new Chinese vegetarian restaurants. 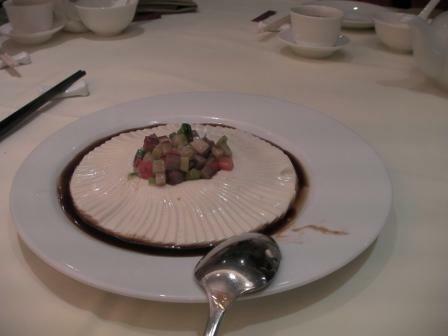 We will introduce 2 great Chinese vegetarian restaurants in Hong Kong and 2 kinds of Chinese vegetarian food styles. Dim sum in one of my favorites Hong Kong vegetarian restaurants. The first Chinese vegetarian restaurant I want to introduce to you is located in the same building as the Hong Kong Seal Stone Museum. It is called Lok Cha Hin. For years that I knew about this restaurant, it didn't have a website until lately. As soon as you step into the building, instead of going upstairs to the museum, just go straight forward. There is a traditional Chinese panel at the front door where you cannot directly look into the restaurant. Once you pass it, you will see the traditional Chinese style furniture and renovations. To some of you, the furniture may not look very comfy because there are no cushions, only wood. But for me, I just love it 'cos cushions hurt my back. My best friend, Anna, and I have our annual visit with each other in this restaurant either for lunch or dinner many times. Unlike any typical Hong Kong/Chinese restaurant, instead of serving 1 pot of tea for the whole table, every individual can pick their own tea and serve it in an elegant Chinese way. One time I ordered a kind of flower tea. It was served in a tall glass. The more hot water you refill, the bigger the flower grew. It was very lovely. Most of the dishes served here are steamed. They serve vegetarian "dim sum" during lunch and dinner hours. The great thing about this place is the menu is different every day. Yes...every day. If you like the traditional tea house serving healthy food with authentic Chinese setting, this is the place to go. Before or after the meal, you can check out the Pacific Place which is one of the best malls in Hong Kong. In front of the restaurant, it is Hong Kong Park. Turn right and walk about 2 minutes, it is the Hong Kong Museum of Tea Ware. This will help you to burn some calories. Another great Hong Kong Vegetarian Restaurants, Long Men Lou, is located inside the Nan Lian Garden. 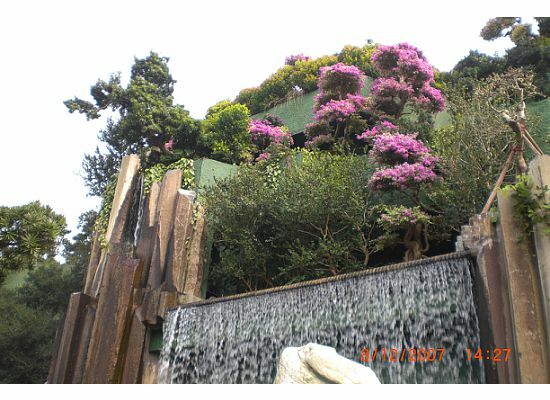 When you see this waterfall, that means you are getting close to the restaurant. 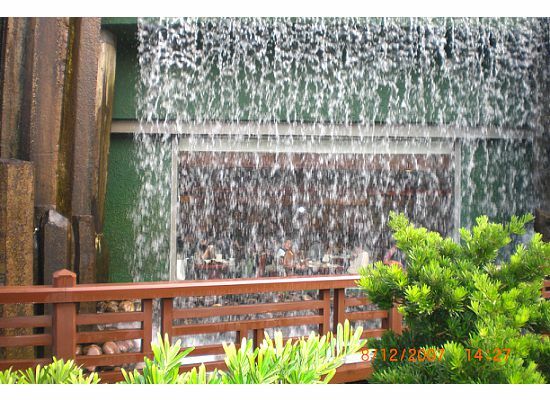 Because of the above picture, my family finally believed me that there is a restaurant behind the waterfall which triggered them to look for it. Unlike the tea house mentioned above in the HK Seal Stone Museum, this Hong Kong Vegetarian Restaurants serves both "dim sum" and entrees at the same time. The renovation is just like the typical Hong Kong tea houses and restaurants. When we were there in 2009, it took a while to get a table and the seating is a bit tight (It may be too tight for me at that time 'cos I was 5-month pregnant). The taste of the dishes were a bit stronger (or tastier I should say) than the one in the Hong Kong Seal Stone Museum. The entrees were very delicate. They have stir-fried, deep-fried and steamed dishes. 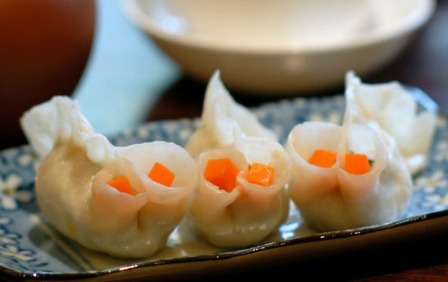 The above 2 restaurants serve Chinese vegetarian dishes with religious background. So, you will never find any "meat" on the menu. What I am going to introduce to you is Hong Kong vegetarian restaurants food. It includes "meat" (don't worry it's not real meat) and the typical or most popular dish is called vegetarian assorted roasted "meat". You can get this dish or take out from any Hong Kong vegetarian restaurants as long as they don't have any religious background. It is very easy to find. If you walk by any Chinese vegetarian restaurant and see the display window with different plates of food in the front, you have found the right place. This dish always contains sweet and sour, curry, roasted "pork", roasted "duck", "chicken" and some "abalone". My mom usually bought a box for take-out and served with white rice for dinner. In this kind of vegetarian restaurants, you can also get many neat vegetarian "meat" dishes. They taste just like meat. Another popular dish is vegetarian "fish" which is made of mashed taro root served with sweet and sour sauce. The taste and texture is very close to mashed potatoes. They also serve stir-fried and deep-fried dishes. These kinds of restaurants are for people without religious backgrounds or want to eat somewhat healthy. If you have never tried this style of Hong Kong food before, I strongly recommend you give it a try. You will be amazed at the taste and the texture of the "meat". Or you may end up to like the vegetarian "meat" more than real meat.